Home > Men's Problems > Baldness: What Can I Do About It? 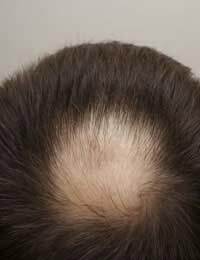 Male pattern baldness is a form of hair loss that affects the majority of men at some point in their lives. A receding hairline or thinning hair is often the start of male pattern baldness, and baldness can affect up to 25% of men in their 20s, almost 50% of men in their 50s and almost all men by their 60s. Baldness occurs when hair follicles shrink and hair re-grows thinner and thinner until eventually hair stops growing in the affected follicles. The good news is that there are a variety of medical, surgical and alternative treatment options for baldness and wigs always remain a possibility for hiding baldness as well. There are two well-recognised medical options for treating baldness. Finasteride, trade name Propecia, is a prescription medication which comes in tablet form and works by blocking the conversion of testosterone to dihydrotestosterone. This conversion means that testosterone does not affect hair follicles and they are able to return to a normal size. In about 66% of men who take finasteride hair will regrow in the follicles, and the other 33% or so will have no hair regrowth but will not experience any further hair loss. Only about 1% of men will experience no noticeable effect. The second medical option is minoxidil lotion, trade name Regaine, which is available over the counter and is not as well understood. About 15% of men who use minoxidil lotion experience hair regrowth and another 50% experience no further hair loss. This lotion is rubbed onto the scalp daily and it may take up to four months for any results to show. Neither option is typically available on the NHS. Hair transplants and scalp flaps are probably the two best known surgical options for treating baldness. There are a variety of hair transplant procedures including follicular unit micrografting, megasession follicular unit micrografting and follicular unit extraction. These procedures all involve taking healthy hair from another area of the scalp (the donor site) and placed in the balding area of the scalp. The hair is implanted via tiny slits, and what is inserted into these slits is referred to as grafts. A hair transplant usually takes a few sessions to complete. Scalp flap surgery involves transplanting healthy scalp and hair from a donor site to the balding area of the scalp. Generally this procedure is best for those who have complete balding at the front of the scalp. Neither of these options are typically available on the NHS. Myriad alternative options for stimulating hair and treating baldness are available to consumers today but it is very hard to regulate such products and determine if they actually do what they promise. Vitamins, herbs and shampoos are the most common forms for such alternative treatments. Anyone interested in using these products should check with their GP prior to doing so. These options are not available on the NHS. Wigs always remain an option for men experiencing baldness, however poorly made wigs are often more noticeable and can be more embarrassing than the area of baldness the man is attempting to cover up. Types of wigs for men such as toupees or hair pieces are available via various online retailers, though purchasing such a product from a trained wig maker who can do a professional fitting and offer advice from experience is always optimal. Wigs can be made from a variety of fibres including human hair and need regular cleaning and upkeep. Wigs are not usually available on the NHS. Though it affects the majority of men at some point, many men remain highly embarrassed by baldness. Today there are a variety of medical, surgical and alternative treatment options for baldness and hiding baldness with a wig always remains a possibility.